It is generally agreed that if a receiver has to be operated where interference is directly radiated, the most effective way of improving reception is to attend to the aerial; the active span should be erected as far from any metallic conductor as possible, and the down lead which is incapable of picking up any radio voltages be used for connecting the aerial to the receiver. The Eliminoise system has been produced for this work, and meanwhile a great number of competitors in England and America have produced a slightly different form of down lead used in conjunction with a doublet aerial. There are two bases on which the equipments have to be compared, namely, signal efficiency (a measure of the drop in signal strength by fitting the down lead) and degree of suppression, which indicates how much interference is entering the receiver by radiation on to the down lead. Signal efficiency: The doublet type of aerial relies to some extent for its efficiency on the fact that its length is of the same order as the wavelength at which it is working; actually on a wavelength of twice the total length of the span, the system is extremely efficient, particularly from the directions which the aerial faces. Pick up is quite good, even along the line of the line of the aerial, where it is least effective. The difficulty is that the resonance which gives rise to this efficient state is usually critical and gives its advantages only on one or two useful wavelengths, and in between anything may happen. The same sort of thing happens in a minor way with the “Eliminoise,” but the windings and cable are so designed that there are not such noticeable rises and falls in the losses on various wavelengths. The “Eliminoise,” however, is more even in response over the shortwave band and is less directional, and we look upon these characteristics as important for broadcast as well as shortwave reception. On medium and long waves the Eliminoise gives far better reception than doublets, which have their down- lead conductors paralleled, since the anti static properties of the latter are almost zero. The few doublets which retain their anti static features on medium and long waves are in most cases expensive and difficult to erect. A further advantage of the Eliminose is its use for multi-point reception. Though some claims are made for doublets as community aerials, they are more troublesome and usually less satisfactory than the Eliminoise equipments using screened cable. The above graph, showing the loss curves for the “Eliminoise’ will no doubt be of great interest to those technically interested in the equipment. The figures represented by these curves are obtained as follows: A modulated H.F. carrier wave of known frequency and voltage was fed from an oscillator into a network representing a typical aerial, and a standard all-wave receiver is connected across the aerial: the output in milliwatts is then measured for the known input. 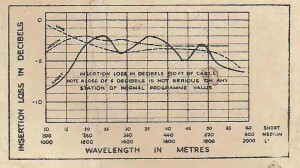 This test was made at various wavelengths from 10 metres to 2000, and the sensitivity curves for the receiver obtained. 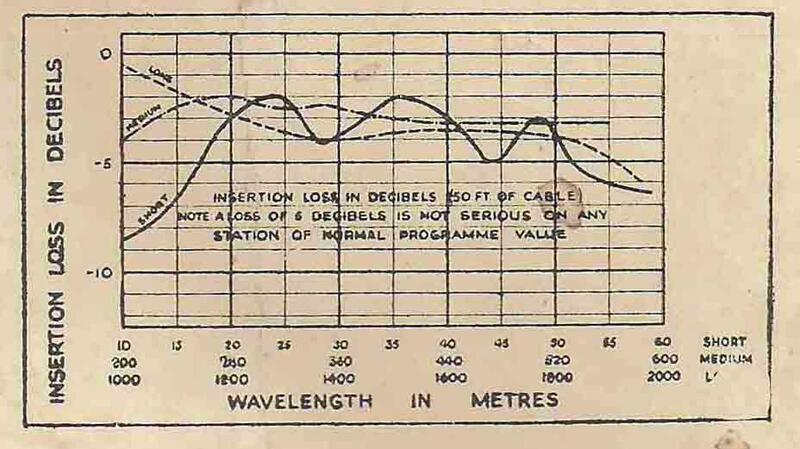 Then an “Eliminoise” equipment, comprising aerial unit, 50 feet type C, earthed at both ends, but not coiled, and a receiver unit was connected between the dummy aerial and the set and the sensitivity curves again taken. As to he expected, some reduction is brought about, and this can be estimated from the two sets of curves by means of the formula: Loss in D.B. equals 20 Log. R1 over R2, where R1 is the reading of the output meter without the aerial, and R2 the figure with aerial inserted.